I have only recenty noticed that my local supermarket sells fresh squid. I often have cravings for salt and pepper squid so was delighted to discover that said cravings would only involve a 5min walk to the shops! If only the chocolate and icecream weren’t located in the equally as convenient location! However back to the squid, this is a lovely quick and easy meal which packs some delicious fresh flavours. It has always gone down well with friends as a starter for dinner or for a no fuss midweek meal. 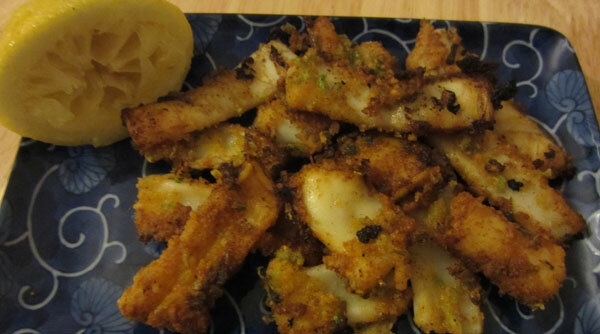 The squid has a crispy light batter with just a pinch of spice. If cooked correctly the squid should not be chewy but tender and delicious. Served with the fragrant mint tabbouleh incorporating the tartness from the lemon and pomegranate it really is a very scrummy combination. 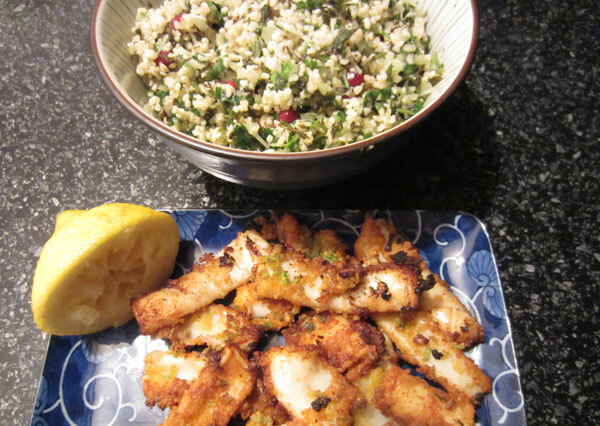 I have adapted this recipe from Yotam Ottolenghi – who’s recipes I love and never disappoint. Pour boiling water over the bulgur and leave for 10 minutes. Drain, transfer to a bowl and add the remaining ingredients. Mix and season to taste. Cut the squid from top to bottom of the body, and open it out with the inside facing you. Gently score in parallel lines about 1cm apart, taking care not to cut through the skin. Repeat at 30 degrees to the first scoring, to get a diamond pattern, then cut into 5cm square pieces and pat dry. In a shallow bowl, mix the garlic, white pepper, Chinese five spice, corn flour, plain flour, breadcrumbs, coriander, sugar and salt. In a separate bowl, whisk together the egg and milk. Heat the oil in a medium saucepan. Throw in a little pepper mix to check that the oil sizzles, then reduce the heat to medium. Dip the squid pieces in the egg/milk, then toss in the pepper mix to coat well. Shake off the excess and fry for up to one minute, turning once, until lightly golden; do this in batches, making sure not to overcook the squid. Transfer each batch to paper towels. 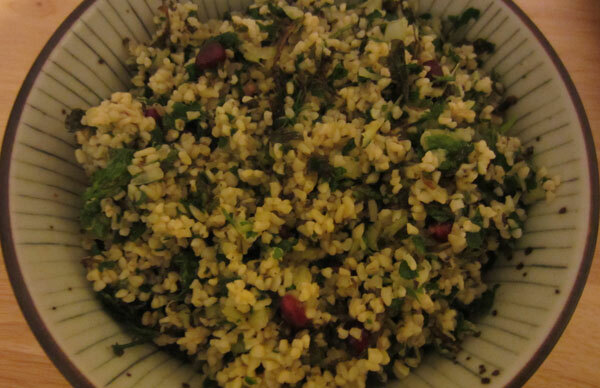 Serve at once with the tabbouleh. Hey Fiona, the squid really doesn’t need long in the oil. Make sure your oil is hot enough, so a pinch of batter should sizzle upon contact and then fry the squid in batches until the batter just turns a golden brown. Only up to 1 minute in the pan. Score the squid when it is laid out flat so that you have a diamond pattern then it doesn’t matter which way you cut it. I usually half it lengthways then cut strips from the width. I hope this helps! Salt and pepper squid is one of my fav things and once you get it right it will be really easy to make!